A Frugal Family's Journey: A Frugal Family's Journey - We Just Joined the 200K Club!! A Frugal Family's Journey - We Just Joined the 200K Club!! We started blogging about our frugal family's journey approximately 22 months ago on March 15, 2014. Our blogging journey honestly started out as a hobby and simply a way to keep on track of our progress. Flash forward almost 2 years later, I am thrilled to announce that because of each and every one of our readers, we just reached yet another milestone today. We are now proud members of the 200K club! And although it took approximately 15 months to reach our first milestone of 100,000 page visits to our blog, the second 100,000 page visits took us less than half the time. Well, 6 months and 28 days to be exact!! Since I am somewhat of a stats nerd, below are some additional stats behind our 200,000 visits. 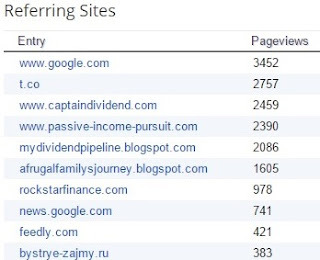 BIG thanks to google.com and twitter, but we also want to recognize and give special thanks to Captain Dividend, Passive Income Pursuit, My Dividend Pipeline and Rockstar Finance for the additional traffic from your respective blogs. 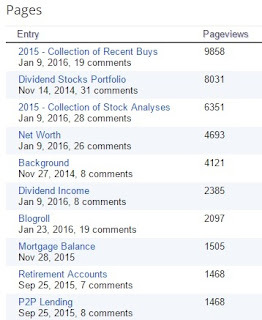 Lastly, although not present on the list above, I would like to also thank two other fellow bloggers and friends, Roadmap2Retire and I Want to Retire Soon, for your continue support and mention of our Collection of Recent Buys and Collection of Stock Analyses. Also, thanks to all that have tweeted or re-tweeted our posts. Our additional presence and our followers on Twitter has truly helped us continue to grow. In case you would like to follow us on Twitter, we can be found under: @FrugalFamilyof4. 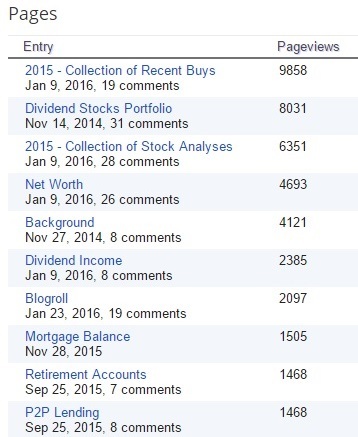 Our top three most popular page visits are: 1) 2015 - Collection of Recent Buys 2) Dividend Stocks Portfolio 3) 2015 - Collection of Stock Analyses. Our two collections and family's dividend stocks portfolio were the difference makers in 2015, let's continue the tradition and make them winners once again in 2016!! 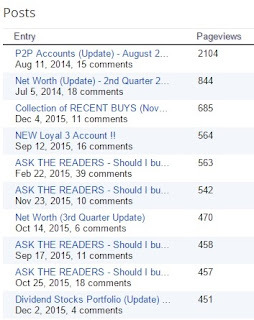 Our top three most popular posts are: 1) P2P Account (update) - August 2014 2) Net Worth (update) - 2nd Quarter 2014 3) Collection of Recent Buys (November 2015 Summary). The top two post remained unchanged as they were the top two from our 100K Club post, however, the third most popular post came this past November from our Collection of Recent Buys Summary. 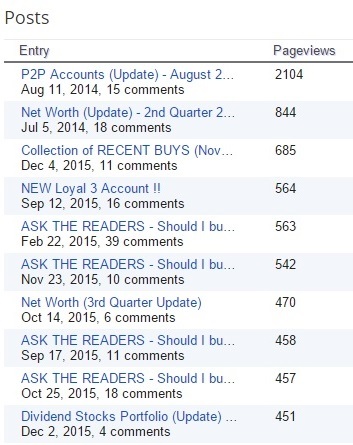 These post received the pageviews they did because of you (our readers and fellow bloggers). Thank you for reading and/or sharing our post with others. We truly appreciate each and every one of you for the support! We are tremendously grateful that our blog has seemed to have a worldwide presence as evident by the chart above. 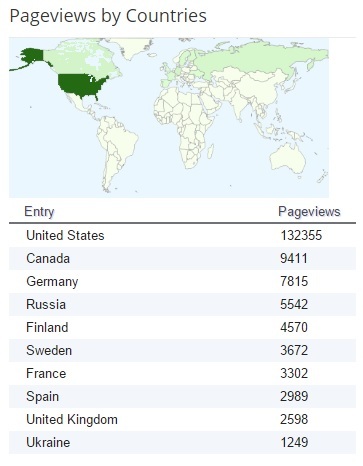 However, the top pageviews to our blog came from the following top three countries: 1) United States 2) Canada 3) Germany. And although Russia and Finland appears to be gaining ground on the 3rd spot, these top three have remained unchanged from our 100K Club post. Congrats on reaching 200k! And getting there in half the time is impressive. It's very similar to investing where the base is hard to get but once it gets started it picks up steam. On to the next 100k! Thanks JC. We have to agree with you on that. It does get easier as the blog and readership grows. It really is impressive what you've done and even keeping an active blog for nearly 2 years is a feat in itself. Best wishes for the next 22 months and beyond. I'll be following along as long as you continue to post! Thanks for the mention as well my friend. Happy to link back to you! Keep up the great work, AFFJ -- and congratulations on reaching that milestone. You'll see that page views will continue to accelerate into the future! It was only a matter of time you were going to cross the 200K milestone. Big cheers to you my friend and excited to ring in when you cross 500K here soon! Keep it up! Thanks Lanny. Feel blessed to see the success we've had so far and hopeful we can continue to grow month after month. Thank you for following along on the journey and thank you for the extra motivation to reach 500K! Damn, thats a lot of pageviews. Congrats on that 200K milestone! Thanks Dividender. I wish I could sit here and say it was easy but it has been a lot of work to get this far. Things seem to be moving just a bit quicker each and every month so hoping that a year or two from now, you'll see us posting these milestones at a quicker pace!